Invoice factoring really can be an immediate cash flow solution if your company is waiting on accounts receivable payment. In prior blogs, we have discussed how to navigate through the cash flow challenge with suggestions on cash flow best practices. There is no doubt that the faster you get paid, the faster you can grow and take care of business. To recap, factoring your accounts receivables allows you access to your cash today, rather than waiting 30 – 90 days for your invoices to be paid. The beauty of accounts receivable financing is that you do not need perfect credit in order to qualify. You may be a relatively new company with little credit history. It does not matter since your invoices are your collateral! Also, since factoring companies take on AR collection it is one less item for you to worry about. Our dedicated team of professionals has a wealth of experience factoring receivables in many industries; helping companies meet payroll, buy inventory, and fulfill large orders that would otherwise have been impossible to take on. It is not necessary to wait 30-90 days for payment when you can access your working capital immediately. 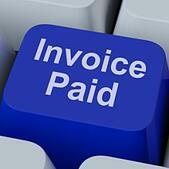 When it comes to invoice factoring, Bay View Funding is here to help. Our professional and responsive team is looking forward to putting together a customized financing solution for you right away. Apply for cash now!